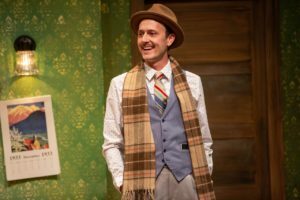 Paul Rutledge in AWAKE AND SING! Photo by Devon Cox. Awake And Sing! is a portrait of a Jewish family living in the Bronx during the Depression. Many contemporary critics (not me!) would dismiss Awake And Sing! as a “living room play.” Talky. Static. Too much offstage action. But Odets’s play contains great richness of character (too much to adequately summarize in a short online review). There’s Hennie (Miriam Schwartz, in a quietly passionate turn), dealing with an unwanted pregnancy. We watch Ralph (Ryan London Levin) grow up and mature, as he deals with an on again/off again girl friend. Morty (Howard Held) the rich uncle who shamelessy departs when the going gets tough. The lean, lanky and tough-minded Moe Axelrod (the powerful Paul Rutledge). Well, never mind. I’ve no intention of ruining the play for you. Awake And Sing! has been produced under the excellent direction of Artistry artistic director Benjamin McGovern. His work here is intelligent and sensitive. John Olive is a writer living in Minneapolis. His book, Tell Me A Story In The Dark, about the magic of bedtime stories, has been published. John’s The Voice Of The Prairie has been performed 100 plus times and ditto Minnesota Moon and his adaptation of Sideways Stories From Wayside School. Please visit John’s informational website.